Sup-R Band is more resistant to punctures and tears than other bands. Sup-R Band is powder free; it's cleaner! Sup-R Band is textured; it's easier for patients to grip. 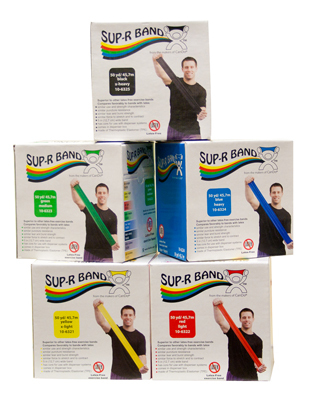 Sup-R Band has the superior strength, durability, and quality associated with latex bands, in a unique, premium, latex free formulation. Sup-R Band simply "feels" better than most other bands. Now there is no need to stock both latex and latex free bands. Sup-R Band; Better For Your Patients, and Your Bottom Line. Buy It. You'll Love It!